A conclusion that drawn over the past year is that mattress manufacturers are more invested in the research and development phase of their products and are really paying attention to what a quality mattress should look and feel like. As a mattress manufacturer, when you have your customers best comfort and support in mind, it’s almost impossible to fail in delivering a product that’s going to become a smashing hit. From memory foam to latex, from innerspring to hybrid, every type of mattress can be excellent if you know how to combine the layer structure and provide pressure point relief up to the level where people don’t want to get out of bed. Today, it’s all about the Nolah and the New Purple mattresses. One of them is a brand that has patented its own combination of foam and latex in order to bring the best of both worlds and up the body contouring game. The other one is already a respectable name in the mattress industry and surprised us once again with its understanding of the human body. It might sound a bit far-fetched, but you have to understand how the human body functions and how to get it into a relaxed and comfortable state if you want to create a mattress that sells. 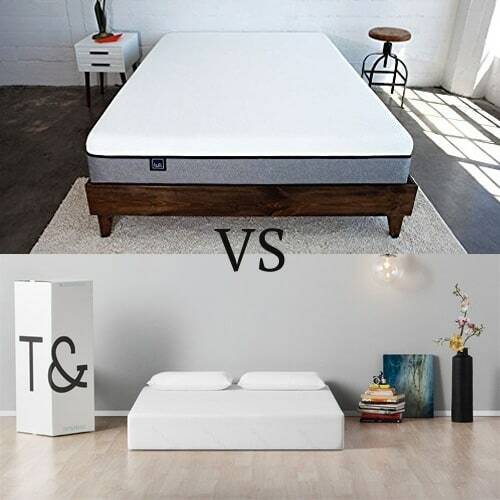 To us, it’s impossible to say which of these two mattresses is better, so we’re going to give you the facts and you can see for yourself which one you think is a potential winner. The cover of the Nolah mattress is a pretty basic blend made with viscose and polyester. The cover is stretchy and fully-white, soft to the touch and pleasant to rest upon. It also feels very cool, indicating that it could be a suitable match for sleepers to tend to run hot. Nolah AirFoam™ is a patented material that the manufacturer developed to take advantage of the best properties of foam and latex. The promise of this materials is to provide the same contouring properties of memory foam, but with the cooling capabilities of latex. But what really makes this Nolah AirFoam™ so special is the comfort and support of this material for people who like to sleep on the side. The transition layer of this mattress measures two inches in thickness and is made from foam that resembles latex quite a lot. Because of that, the layer has a quick response to pressure, reminiscent of the bounciness that’s typical to latex. This layer provides support, while also helping the mattress transition from the comfort layer to the base of the bed. The base layer of the Nolah mattress is made with seven inches of high-density polyfoam. This layer has a quick response to pressure and gives the mattress shape, stability and durability. The firmness and feel of a mattress are the factors that are going to determine the sleeping category that the bed addresses. It’s what you should always pay close attention to before ordering a mattress online, as it will be a key factor which indicates if your body will receive the proper contouring and pressure point relief in your most favorite sleeping position. 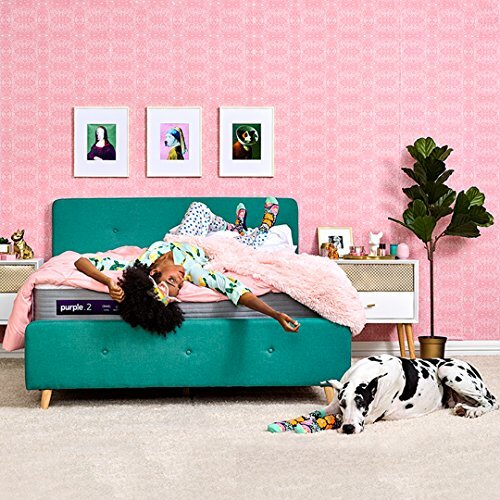 Because it uses a sleek combination between foam and latex in its comfort layer, the Nolah mattress has a firmness rating that varies between 5 and 6, depending on your weight and sleeping position. The Nolah is indeed one of the softest mattresses we’ve tested, but let’s examine the feel of the mattress in the three different sleeping positions before giving out a clear verdict. The feel of a mattress is everything. It is a result of the efforts to combine comfort, support and pressure point relief. I’ve had my fair share of mattresses which I believed were too firm, yet my better half slept on them like a baby. That’s because we each prefer a different sleeping position and have completely different weights. So, let’s examine the pressure points created when sleeping in different positions on the Nolah mattress. First off, we have to state that the majority of mattresses we’ve tested were supportive for back sleepers, regardless of the firmness of the product. 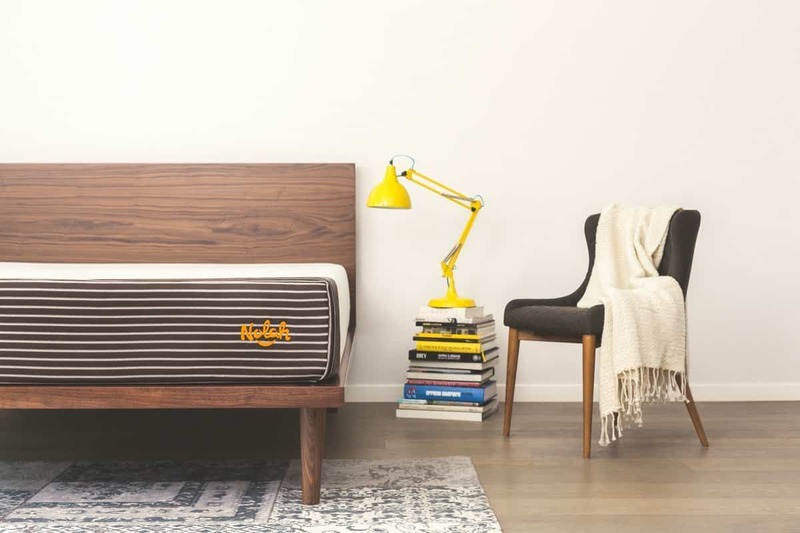 With the Nolah mattress, things are a bit different. When you first lie down in this position, you will feel the heavier parts of your body sinking into the mattress. While the comfort layer does a good job in keeping the spine aligned, back sleepers don’t normally enjoy this feeling of sinking into the mattress. But despite this feeling, switching positions was relatively easier than expected. Although the mattress doesn’t provide the best response out of all the models we’ve tested, rolling over to the side isn’t that difficult considering the results we’ve gotten so far. But enough criticism, it’s time to get to the part where the Nolah mattress truly does shine. There is literally no pressure felt in the hips and shoulders region, which are typically the most pretentious zones and the hardest ones to accommodate. As for stomach sleepers, there’s good news and bad news. While the Nolah will manage to keep you very comfortable when lying in this position, your hips will sink into the mattress quite a lot, bending the spine to an unnatural position. So, despite it feeling comfortable, sleeping on your stomach could lead to back pains on the long term. 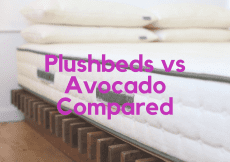 With a mattress that’s this soft, we don’t expect any excellent results in terms of edge support, but let’s not judge a book by its cover and examine the actual tests results. It wouldn’t be the first time a mattress surprises us in a pleasant way. Edge support is even more important when you’re sharing a bed with a partner and find yourself rolling over to the edge of the bed. Keep in mind that this is an all-foam mattress, so the results of the edge support test might not be the best ones ever. As you lie down close to the edge of the bed, you will feel some compression. While you won’t fall off the bed per se, the mattress will sink in more than it does with other models we’ve tested. Sitting on the edge of the bed is not as supportive as we’d like, but unless you plan to spend hours in this position, it’s supportive enough for a quick sock-dressing session. As you will come to learn, there are quite a few differences between the Original Purple mattress and this upgraded model. We’ll start off with the top cover, which keeps the use of polyester, like its predecessor, but uses spandex in the blend. This results in a stretchy material, which feels very pleasant to the touch, but also runs cool due to its thickness and construction. The Original Purple mattress was all about the comfort layer made from those superelastic polymer columns that distributed your weight evenly across the surface once a specific pressure threshold was reached. The same construction is present in the comfort layer of the New Purple mattress, only this time, the thickness of the layer depends on the model chosen. Choosing the Purple 2 will translate into a two-inch layer of polymer; Purple 3 has a three-inch layer while Purple 4 has four inches of comfortable polymer columns. That’s why the height of the mattress will vary. Of course, the thicker this layer is, the plushier it will feel. It still sports all the features that we’re accustomed to getting from its Original counterpart: high breathability due to the grid-like structure, a quick response to pressure to facilitate movement and the ability to determine where your body needs additional support for better pressure relief. Because the polymer columns need support and sustainability, the New Purple mattress features a thin layer of polyurethane foam. This acts as the transition layer between the comfort grid above and the support layer below. Here we have 7.5 inches of individually wrapped coils. It’s important to understand the gigantic difference between these coils and the ones that used to be part of traditional mattresses. When you apply pressure on a layer of individually wrapped coils, they will only bend under that specific pressure, without affecting other coils. That’s because the coils aren’t connected with one another, much like domino pieces are. And since we’re talking about coils, there’s also the benefit of added bounciness and responsiveness of the mattress. Even more, the structure of the layer offers plenty of space for air to circulate through and prevent overheating. The smart move for every innerspring mattress is to add a base layer to protect it from hovering and applying pressure straight on the base of the bed. 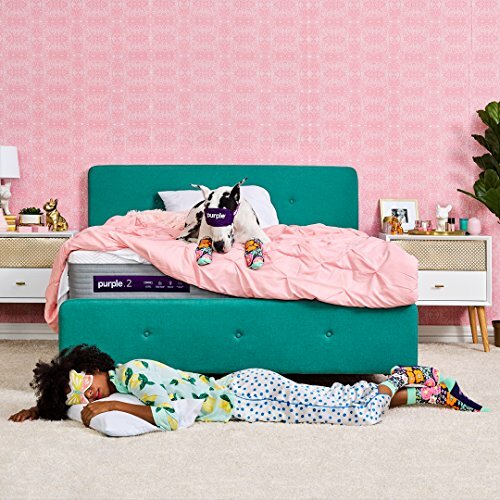 The New Purple mattress does exactly that: it adds a thin layer of high-density polyfoam into the equation, to better support the layer above it. 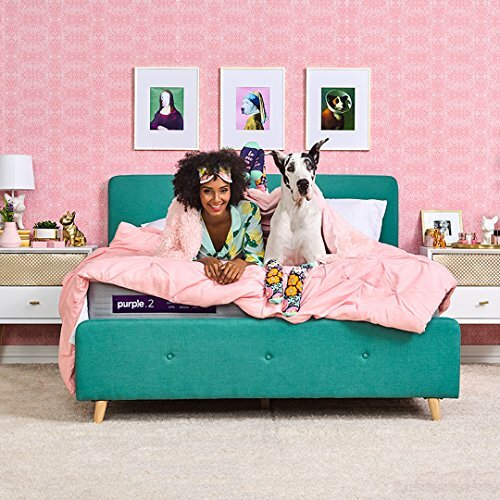 As you’ve already guessed by now, the firmness of this mattress will depend on the model chosen: the Purple 2 is the firmest model of all, while the Purple 4 is softer and offers more cushioning. But today we’re going to focus on the firmness and feel of the Purple 3. As always, keep in mind that while we do give a personal firmness rating, you might feel the mattress a little bit different than we do. The Purple 3 has a firmness rating of about 6 to 6.5, bringing it to the industry average for a medium mattress. 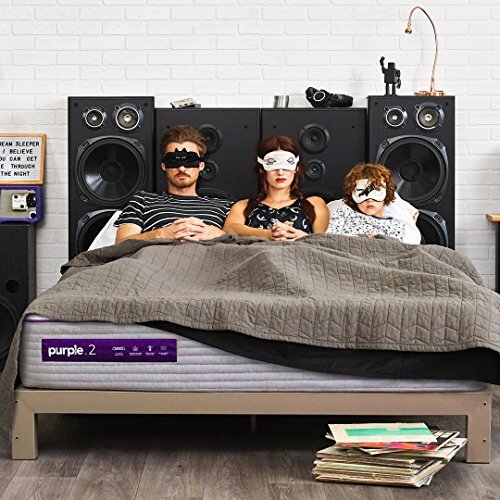 Those of you who are looking for something firmer will definitely want to check out the Purple 2, while plush mattress lovers will surely appreciate the Purple 4 a lot more. There’s a reason why we insist on pressure point relief in different sleeping positions: they are the indicators of a mattress that’s either good or bad for you. When you’re lying on your back on the New Purple 3 mattress, you will feel how the polymer columns work to provide support and comfort where needed. The gap that typically formed in the lumbar region is filled, making sure that your spine rests in a comfortable position. 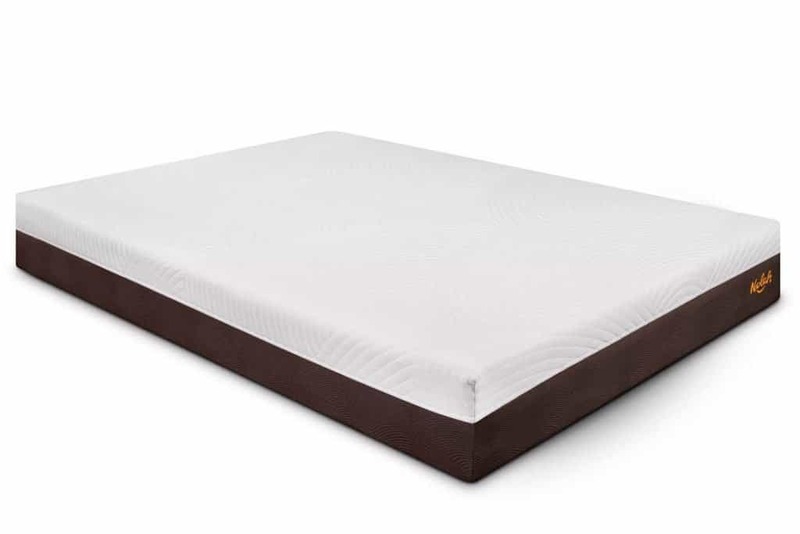 Because the polymer and the coil layer give the mattress a good deal of bounce, it’s really easy to shift between sleeping positions and roll over to the side with ease. What’s really great about the Purple 3 is that it provides a great deal of pressure relief in both the side and back position. You won’t feel any tension in the shoulder or hips area, because the comfort layer molds to the shape of these pressure points and allows them to sink as deep into the mattress as they need. Stomach sleepers will also benefit from good support, although this sleeping position typically needs a firmer mattress, so the Purple 2 is definitely worth checking out if you like to sleep on your stomach. Overall, the Purple 3 seems to go a really good job in supporting every one of the three main sleeping positions. The Nolah mattress is definitely the promise land for all side sleepers. The soft comfort layer provides the best support possible for your shoulders and hips, allowing them to sink in and be cradled by the contouring properties of the Nolah AirFoam™. Make no mistake, the mattress can accommodate other sleeping positions as well, but there are some downsides to back and stomach sleeping on this particular bed. Because it has minimal motion transfer, this mattress is a really good choice for couples, especially if both sleeping partners spend most of their night sleeping on the side. Even more, the good combination of latex and foam has created a material that runs cool, which makes the Nolah a viable choice for people who don’t want to worry about sleeping hot. Congrats, Purple, you’ve outdone yourself this time! You’ve created a mattress that can support every sleeping position yet again. 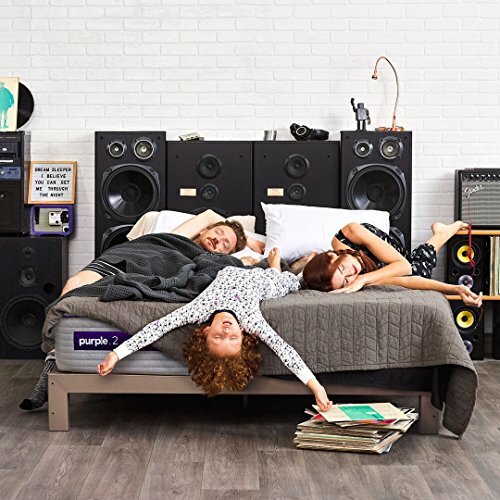 If you’re one of the people that want a mattress with a good combination of support and pressure relief, the New Purple mattress is yours for the taking. With the column structure in the comfort layer, plus the individually wrapped coils, the mattress does a great job in allowing your body to breathe, so you never have to experience overnight heating anymore. 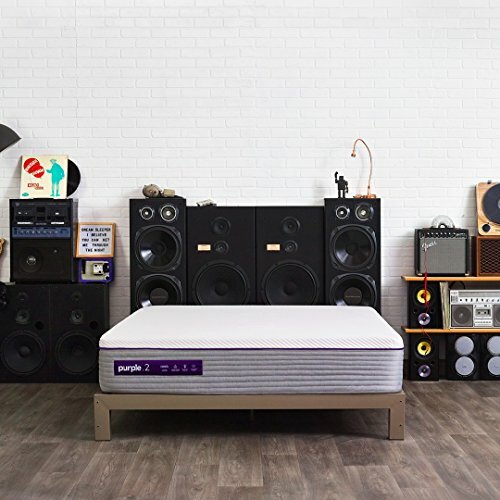 Those of you who love a bouncy mattress, but like to switch positions a lot during the night and need all the support you can get, the New Purple mattress definitely deserves a shot. 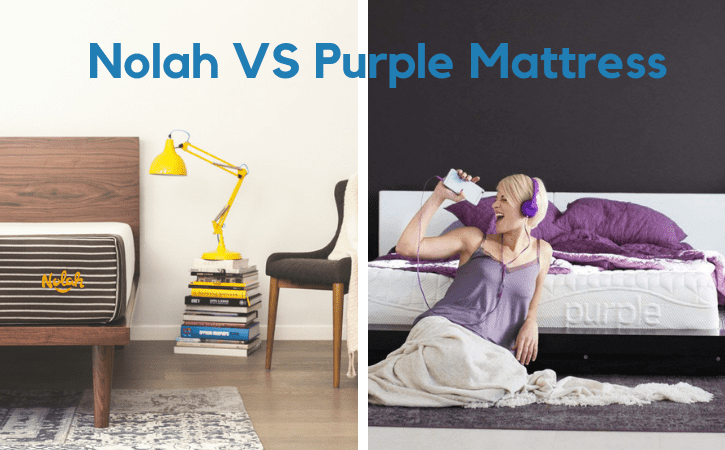 Oh boy… when you have to review mattresses as good as the Nolah and the Purple, the purchasing choice is almost impossible. That’s why we always recommend making a list of priorities to determine what it is you’re looking for in a mattress. Both of these beds provide excellent pressure point relief while being able to cradle the body to bring it to a much-needed point of comfort at the end of an exhausting day. So, if the choice ultimately comes down to one of these two mattresses… we’re glad we don’t have to make that choice for you.